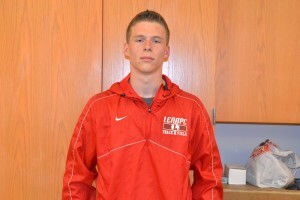 Lenape High School senior Ray Backus has established himself as one of the best track and field throwers in Burlington County. Last year, he finished 10th in the discus in the South Jersey Group IV sectional meet and has his eyes set on advancing to the Group IV state championship meet this season. As a result, Backus got interest from a number of colleges that want him to join their team. However, Backus won’t be going to college next year. Instead, Backus has decided to enlist in the United States Marine Corps. Backus will leave New Jersey for boot camp on July 25 and plans to be a thrower for the Marine Corps track team. Backus said he planned to join the Marines at some point in the near future, but felt it made the most sense to do it right after high school. Before joining the Marine Corps, Backus has some unfinished business to take care of at Lenape. In the 2015 spring season and 2015–16 winter season, Backus just barely missed a spot in the Group IV championships. Last spring, his throw of 136 feet in the discus was good enough for 10th place in sectionals, but not enough to get him in the top-six to advance to the state meet. Last February, Backus came close again to states, this time in the shot put. This time, Backus finished in eighth place with a throw of 42-feet, 6.5-inches. Backus finished just 5.5 inches behind sixth place, and he was again denied a spot at the state championships. This spring, Backus has made huge strides to improve his performance, especially in the discus. At the Jack Armstrong Invitational in Abington, Pa., on April 23, Backus set a new personal best with a throw of 145-feet, 4-inches. The throw is the best of any athlete from the Olympic Conference so far this season. Keith Giberson, the throwing coach for the Lenape boys’ track and field team, said Backus has put in a lot of work both during and outside of the season to improve. Giberson saw Backus’ talent during his sophomore season. Despite not picking up discus until high school, Backus got a chance to throw at sectionals for the first time as a sophomore. Even since then, he has been motivated to get past that hurdle and compete at states. Advancing to states isn’t the only goal for Backus. He is also trying to break the Lenape school record for discus. The current record of 164-feet, 7-inches was set by Ray Stinsman in 2010. Giberson is working with Backus on a few small technical improvements to try to get him to the 164-foot mark. One other goal Backus has is team-focused. He wants to help Lenape score as many points as possible in the throwing competitions to help the team at meets.